Bonjour my readers! Well if you've noticed I decided to make le title in French. It actually means "The thieves who became children." -- though I just used Google translator to do so. I might want to do some pretend I'm French when I'm not for every Lupinranger vs. Patranger review in honor of Maurice Le Blanc's estate. Now it's time to move for le review, shall we? It does worry le Global Police about their on/off alliances with Lupinrangers. It reminds me of a scenario when vigilante superheroes end up cooperating with the police. I'm taken back to the 90s with SWAT Kats -- Lt. Feral disapproves of le SWAT Kats while his niece does otherwise. They're a police and of course it's not going to be good for them to team up with vigilantes. This also makes me think of the number of times Detective Zenigata has to cooperate with Lupin III when both of them have common enemies. Well I haven't done a movie review for some time, haven't I? I think I do have some VS. Movie catching up to do such as Kyoryuger vs. ToQGer and ToQGer vs. Ninninger now that I'm somewhat out of the taste fatigue zone. Right now, I thought about the Space Squad movies which started with Gavan vs. Dekaranger. 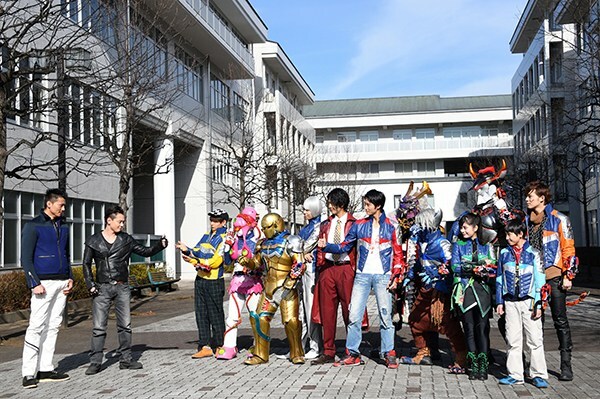 Now it's time to link both universes (Kyuranger and Space Squad) in this movie where it's supposed to happen four years after the fall of Jark Matter. The whole movie somewhat gets its inspiration from Avengers: Civil War since one side defends Hammy (Lucky's side) and the other wants to arrest her (Tsurugi's side). 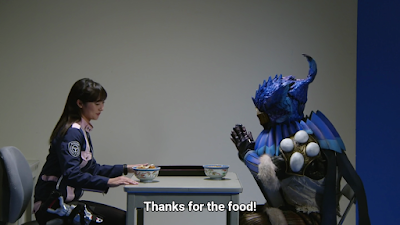 The movie shows ups what could have become of the others such as Garu is now a family man, Spada is still running his restaurant and Stinger is still the commander. Bonjour my readers! As of late you have noticed that le entries in this blog has ran rather low, right? Okay, I've decided to tone down on my pretending to be French here for easy reading -- since most of my readers are English speakers! In this week's episode -- it's time for another difficult decision on the two sides -- le Lupinranger and Patrangers must cooperate but can they finally cooperate together to destroy le Ganglers? Last week's episode has le experimental frankenstein of Gauche shrink after defeating le Patrangers. 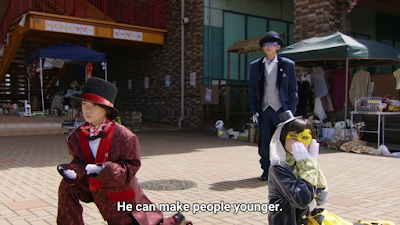 Le Lupinrangers try to get le safe but it turns out that it's easier said than done. Lupin-X appears and rescues le Lupinrangers. Noel reveals that le five safes are linked into one into the crack project. Kairi suggests using Good Striker but le latter is now weakened. Le split technique can't be used. This also has another difficult situation. 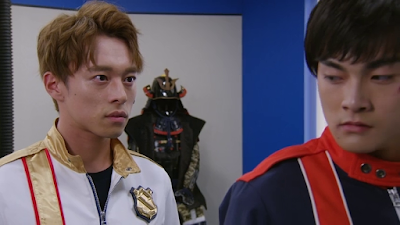 Lupinranger VS. Patranger Nombre 31: Le Repentant Gangler? Bonjour readers! Just in case yo didn't notice -- I haven't been posting much here since I want to focus more on other stuff while watching this year's Super Sentai. So here's my weekly Lupinranger vs. Patranger weekly post and I don't think I'd post much this time for now. Le episode starts with a magnificent toy commercial of sorts. We see some Golums and le Lupinrangers defeating them. It's not that Gauche is having some kind of plan. But what plan is it? It gets thrilling or predictable -- you decide! A Gangler named Yoshi turns himself in. This results to some hilarious hijinks especially how can you easily trust a low life? It's too good to be true that a Gangler would just turn himself in so easily! In this episode, Tsukasa gets her soft side which shows how heroes are flawed -- no matter how much of heroes they are! Bonjour my readers! If in case you didn't notice le title where I'm purposely using some gratuitous French -- vacances is le French word for vacation and deux means two. This episode is a fun one at it -- especially with some twist and turns around it. Keiichiro is going on vacation? That's quite a surprise. I can't help but think it's an undercover mission. It's been a common trope in fiction to pretend to go on vacation. Keiichiro gets a "late summer vacation" considering that fall is just around le corner -- September 24, 2018 will be le next Midautumn Festival and it's time for games!